Aesop Rock crams loads of big words into his hip-hop fables. He raps about a "dystopian getaway" and claims to be as "stubborn as a thousand born-agains avoiding questions." Not surprisingly, such circumlocutory tendencies have earned the 25-year-old New York City rapper a reputation as a David Foster Wallace for the backpack set, which he insists is all wrong. "People'll come up to me and say, 'Who are your favorite authors?'" says Aesop (a.k.a. Ian Bavitz). "I went through a long period where I hadn't read a novel. I tell them this and they seem let down." Such are the vagaries of rap's braniac underground, a world that prizes obscurity as much as flow. 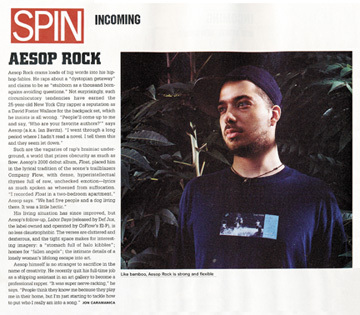 Aesop's 2000 debut album, Float (Mush), placed him in the lyrical tradition of the scene's trailblazers Company Flow, with dense, hyperintellectual rhymes full of raw, unchecked emotion - lyrics as much spoken as wheezed from suffocation. "I recorded Float in a two bedroom apartment" Aesop says. "We had five people and a dog living there. It was a little hectic." His living situation has since improved, but Aesop's follow-up, Labor Days (released by Def Jux, the label owned and operated by CoFlow's El-P), is no less claustrophobic. The verses are cluttered and dexterous, and the tight space makes for interesting imagery: a stomach full of halo kibbles"; homes for "fallen angels"; the intimate details of a lonely woman's lifelong escape into art. Aesop himself is no stranger to sacrifice in the name of creativity. He recently quit his full time job as a shipping assistant in an art gallery to become a professional rapper. "It was super nerve-racking," he says. "People think they know me because they play me in their home, but I'm just starting to tackle how to put who I really am into a song."